This is a game between a side that is running out of time to book their spot in the Playoffs and a team that officially ran out of time last week. 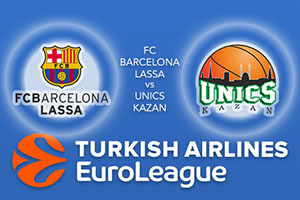 Yes, Unics Kazan know that their Euroleague campaign is limited to the regular season this year and to be honest, it is likely that FC Barcelona Lassa will be joining them in that state of affairs. It wouldn’t quite be the sort of turnaround victory that the Catalan football club managed against Paris Saint Germain in the Camp Nou on Wednesday night, but if the basketball side from Barcelona make the Playoffs, there will have been a big turnaround. These teams have met on six occasions and Barcelona have won them all. This includes the game earlier on in the season when the score finished 63-69 in Kazan. Justin Doellman had a massive game with 23 points and he will need to be on fire if the hosts are going to get a win that boosts their chances for the final few weeks of the Euroleague regular season. Barcelona have lost five of their last six games and this is why it is unlikely they will make their way into the Playoff spots. Tyrese Rice has been a key player for the Catalan side, with an average of 13.9 points per game while Petteri Koponen has provided an average of 10.3 points per game. Of course, having a player that scores points doesn’t mean that you are guaranteed to win games, as Kazan know all too well this season. In Keith Langford, Kazan has the top scorer in the league, offering 22.3 points per game, but their season has been a blow-out. Art Parakhouskis has offered an average of 11.7 points per game this season and Quino Colom has chipped in with an average of 11.6 points per game. You can back FC Barcelona Lassa at -5.5 which is provided at odds of 1.90. If you’re looking for the Over/under market, go UNDER 152.5, on offer at 1.90. Bet Now!